with minimum 60% marks or Degree in Law or Graduate with Associate Membership of the Institute of Company Secretaries of India with desirable qualification of Professional Degree in Law with minimum 55% marks or B.E./B.Tech. (Agri. Engg.) from recognized University/Institutions with minimum 60% marks or Pass in CA/CMA (ICWA) or 2 years full time MBA. 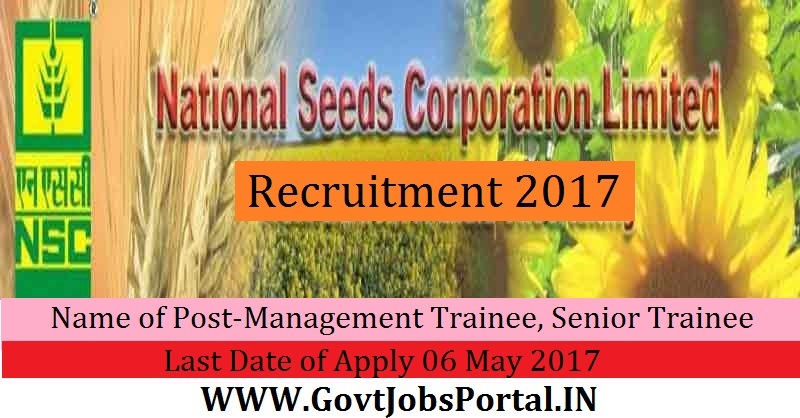 Indian citizen having age in between 18 to 27 years can apply for this National Seeds Corporation Recruitment 2017. Those who are interested in these National Seeds Corporation jobs in India and meet with the whole eligibility criteria related to these National Seeds Corporation job below in the same post. Read the whole article carefully before applying. with minimum 60% marks or Degree in Law or Graduate with Associate Membership of the Institute of Company Secretaries of India with desirable qualification of Professional Degree in Law with minimum 55% marks or B.E./B.Tech. (Agri. Engg.) from recognized University/Institutions with minimum 60% marks or Pass in CA/CMA (ICWA) or 2 years full time MBA. What is the Process for Selection this Seeds Corporation Job? What is the Application Fee for these Seeds Corporation Jobs?